"Here's a theory for you to disregard. Completely. Music, true music, not just rock and roll, it chooses you." In 1973 I was 13, and just beginning my life-long foray into real rock and roll. My personal thoughts and recollections of my own musical development and discovery are as vivid today as they were then, and full of that same wonder and awe. 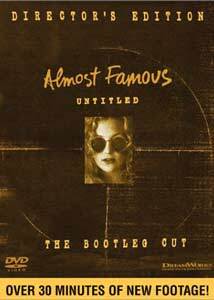 Consequently, the original theatrical release of Almost Famous was a "goosebump" movie for me. Like Field Of Dreams, which yanked a whole set of other personal strings, Almost Famous was one of those films that so completely captivated me from the opening frames that I became nothing more than a pile of human putty as I relived the helter skelter rock world of the 1970s. It was sort of like peeking into a celluloid mirror. Director/writer Cameron Crowe (Jerry Maguire) so perfectly captured the joy and love of rock and roll, meshed within that hazy, rebellious era, that I couldn't imagine, prior to seeing that film, that there was any filmmaker who felt the same raw and emotional attraction to music that I did. This new 2-disc set from Dreamworks dramatically adds to the overall impact of the theatrical release, with the inclusion of the two hour and forty minute director's cut known as Untitled, which features 35 minutes of additional footage. Former Rolling Stone writer Crowe's film is the semi-autobiographical tale of a young boy's immersion (both personally and journalistically) into the frenetic world of rock music. On it's most base level, the story focuses on William Miller (Patrick Fugit), a 15-year-old rock journalist wannabe who finds himself on assignment from Rolling Stone traveling on the road with an up and coming rock band by the name of Stillwater in 1973. Tethered by phone to his worried and anxious mom Elaine (Frances McDormand), William struggles to not only grow as a person, but to get to the heart of what makes Stillwater tick. Crowe's film works on a much more personal level than that, at least for me. As William ingratiates himself into the inner circle of Stillwater in order to write his article, he glimpses the real pumping heart of rock as guitarist Russell Hammond (Billy Crudup) laments aging bands that lifelessly limp into performing what amounts to "lifestyle maintenance" music. The concerns of vocalist Jeff Bebe (Jason Lee) about William the journalist being "the enemy" are negated by his wish to quoted "warmly and accurately." The inner workings of a mid-level rock band are exposed to William with all the corresponding warts included, and he wrestles with his personal feelings toward the band members and his ability to write the article impartially. As rock becomes business, the thin line between creative success and creative freedom seems tenuous, at best, and the harshness of life on the road becomes quite sobering. As William begins his journey on the road touring with Stillwater, he meets the lovely Penny Lane (Kate Hudson), who is not just simply a groupie, she is a much-heralded "true fan" with a genuine love of rock and roll who selflessly leads her pack of loyal "Bandaids". Penny, along with Polexia (Anna Paquin) and Sapphire (Fairuza Balk), become an integral part of the backstage experience, and slide in and out of the lives of the bands they adore. These girls live for the music, and their lives would have been empty without it. A touching romantic triangle quietly develops between William, Penny and Russell that forms part of the dramatic core of the script. Yet this is not the stereotypical three-sided relationship we have seen before, and it's not fair to Almost Famous (or Untitled) to attach such a simple descriptive plot tag. The volatile relationship between Jeff and Russell also serves as a key story line, and it is equally as critical to the culmination of Crowe's script. The addition of the 35 minutes of previously excised footage is not instantly jarring, but does offer a little more depth and obviously freed Crowe from some of the editing constraints the theatrical release forced him under. I never felt the original release, which itself was just over two hours, was hastily cut, but after seeing this director's cut I can really see how Crowe's original story had even more to say, no matter how subtle. This new, expanded version does not feel bloated or excessive, but rather naturally extends Crowe's romantic vision of rock and roll. There are so many wonderful little musical moments in this film; scenes that by themselves are perfect little snapshots of an era that was so important to me. Crowe's use of period music (The Allman Brothers, Black Sabbath, Elton John), which so often can end up as blatant time fillers in lesser films, give the scenes so much depth that I almost get goosebumpy just thinking about them. Anita's (Zooey Deschanel) use of America by Simon and Garfunkel to illustrate her need to leave home to become a stewardess is naturally sweet, and when William first gets backstage with Stillwater, to the strains of "Your Move" by Yes, really opens the floodgates of my musical youth. Stevie Wonder's Cherie Amour as the theme for the grim stomach-pump scene is yet another excellent use of period music to instill an instant level of relatable poignancy, more than any dialogue could convey. The performances in Untitled, while maybe not Oscar-caliber, give Crowe's story the necessary legs to carry the weight of his strongly personal narrative, though I'll admit that some of the dramatic plot points are a little contrived at times. Despite some of the formulaic moments, the cast remains effective. Fugit's William, all fresh-faced and rosy-cheeked, is our eyes into the seamy underbelly of rock and roll. His starry-eyed gaze as Penny Lane invites him to move to Morocco with her is one of those quiet little scenes that resonate with a hormonal intensity that seems to move beyond acting. Much has been written about Kate Hudson and her dreamy characterization of Penny Lane. The frail Penny is an actor's dream role, with opportunity for a wide range of slowly revealed emotions as the story unfolds, and Hudson carries it well. Frances McDormand (Fargo) never lets her portrayal of Elaine become a cliched frenetic mom role, and her revealing phone call with Russell is one of the film's many highlights. Lee and Crudup give surprisingly natural turns as the bickering and confused rockers. Actors portraying rock stars is always an iffy proposition (anyone remember Eddie And The Cruisers), but there is never any doubt that these guys are anything but the leads of a 1970s rock band, especially Lee. Fellow Stillwater members bassist Larry (Red House Painter's Mark Kozelek) and drummer Silent Ed (John Fedevich), although in supporting roles, give the fictitious band the necessary solid realism. As a teen-aged rock fand of the era, my favorite moments in this film are the scenes with Philip Seymour Hoffman's Lester Bangs. The vitriolic firebrand editor of Creem is nailed by Hoffman, and his rant about "being cool" stand as one of the defining passages of dialogue written by Crowe. I remember digesting purloined dog-eared copies of Creem in my youth, stunned by the explosive and truthful writing of Bangs. Hoffman scenes are simply terrific, and for me really represent what it means to love music and have it become a driving force in your life. I'm only a couple of years younger than Crowe, and I've often wondered how that affects my feelings about this film. I would love to find out if twenty-somethings felt the same romantic appeal of rock and roll when watching this film that I did, or if some of the impact is lost since the story concerns a bunch of rock dinosaurs. With the obvious exception of having not traveled on the road with a band, I had (and still have) the same type of intense love of rock music that is so predominate in so many of the characters here. It's hard for me to imagine if I would have been so personally attached to the story if it had been set in the 1950s, or the 1990s, for that matter. Artists like The Who, David Bowie, Elton John, Iggy Pop and Yes were dramatic moving forces in the development of my musical tastes, and it's obvious it was that way for Crowe, also. Just take a look at Untitled if you need the proof. Image Transfer Review: Dreamworks 1.85:1 anamorphic widescreen transfer is a beauty. Working from appears to have been a blemish-free source print, the final product here is full of warm, well-saturated colors. Black levels are dead on, and provide excellent shadow delineation, as witnessed in the late-night poolside chat between Russell and William. The newly added scenes blend well with the original footage, and don't appear as glaring or obtrusive inserts. Audio Transfer Review: The lack of a DTS track for the director's cut may raise the hackles of some, but that is a minor beef (the included theatrical cut features a DTS track, however). Don't worry, because the 5.1 Dolby Digital track paints a full and engaging sound field. Spread for the most part across the front three channels, this audio transfer has some solid directional imaging. The Stillwater concert sequences make ample use of the rear channels, as does tense airplane scene near the film's conclusion. Most the surround cues are subtle, and give a natural depth to the audio transfer. The 2.0 surround track stands up fairly well next to the 5.1 mix, but lacks the overall dynamic range. Extras Review: Dreamworks has put together a very impressive set, both visually and content-wise, that captures what Crowe refers to on the commentary track as the "clandestine appeal" of bootlegs. A quick audio intro of not more than 30 seconds by Crowe, where he points the intent of this two-disc set to resemble that of an actual bootleg box set, in both design and content. The big news here is the full-length scene-specific commentary from Cameron Crowe and his mom Alice on Untitled. Less of a technical analysis and more a casual reminiscence, director Crowe is never really at a loss for words, and he offers up a wealth of background stories that help flesh out the onscreen action. Crowe calls the commentary an "embarrassingly personal approach", and as such much of the info relates to his personal recollections. His back-and-forth banter with mom Alice is an unusual treat in a commentary, and her thoughts on McDormand's portrayal of her are entertaining. The attention to the small details are the subtle tidbits that make the film all that much more enjoyable. Details such as the plaid bag containing the albums Anita wills to William is the actual bag Crowe's sister gave to him, or that the street that William and Lester Bangs walk along is the same street that their original encounter occurred. Vinyl Films Andy Fisher and Scott Martin, as well as Dreamworks Mark Atkinson and personal friend Ivan Carona contribute sporadic tidbits. The commentary track is also provided with available English subtitles, so you can watch the film and read the comments, if you prefer. This is a hilarious, but brief, interview with the outspoken one-time editor of Creem. The late Lester Bangs rips sharply on Bryan Ferry ("vacuous") and Emerson, Lake and Palmer ("music sterility at it's pinnacle"), among others. The inclusion of this clip only emphasizes how well Philip Seymour Hoffman nailed his portrayal of Bangs in the film. A set of 7 Cameron Crowe-penned Rolling Stone articles from the 1970s, on artists The Allman Brothers, Led Zeppelin, Neil Young, Peter Frampton, Fleetwood Mac, Van Morrison and Joni Mitchell. Crowe offers a brief audio intro to the segment. Crowe provides a short description of ten of his favorite 1973 releases, from artists like The Allman Brothers, David Bowie, Jackson Browne and Elton John. Accompanying Crowe's audio is a graphic of each album cover. Set to video footage of the band Stillwater rehearsing, this piece features Crowe's rock star wife Nancy Wilson (Heart) doing her original version of the song "Love Comes And Goes", which according to the director is sung in her "man voice". A quickie collection of behind-the-scenes footage, dominated primarily by a hotel room rehearsal of the newly added "radio interview" segment. As a bonus, hidden on disc 1 is a deleted scene easter egg, complete with an audio intro by Crowe. The 4m:49s scene, an homage to a scene in Truffaut's Stolen Kisses, features Hudson's Penny Lane endlessly repeating the name "Leslie", so that it becomes "nothing and everything", at least according Crowe. As far as easter eggs go, this one is pretty easy to find. Same as what appears on disc 1. What a bonus! The 1.85:1 anamorphic widescreen theatrical cut of Almost Famous, offered in English 5.1 Dolby Digital, DTS, and 2.0 Surround. Also included is a French 5.1 Dolby Digital track. 24 chapters, as well as English, Spanish and French subtitles. A 1.85:1 widescreen trailer, presented 5.1 Dolby Digital. To further the mythos of the fictions Stillwater, this segment purports to be a "live" concert, circa 1973. The band do a few of their "hits", and the whole piece is pretty straight-forward concert footage. Despite all of the great music featured in the film, securing the rights to Led Zeppelin's "Stairway To Heaven" proved impossible. This deleted scene, quite pivotal in hindsight, was to be a variation on Anita's use of Simon and Garfunkel to explain her need to leave. William's teachers attempt to convince mother Elaine what a great opportunity it would be for him to go on the road as a rock journalist. William uses "Stairway To Heaven" to try and convince his mother, and since there was, and apparently still is, a copyright issue, this scene plays without sound during the playing of the actual song. However, clever onscreen text provides instructions for you, the viewer, when to cue up your copy of the song to get the full effect. An extended scene from the Continental Hyatt sequence, when William, Penny and Polexia are first wandering the hotel hallways, looking for Stillwater's rooms. In a Crow tribute to Gram Parsons, William catches a brief glimpse of a man and woman singing an acoustic version of "Small Time Blues". This new extended sequence features the entire song, performed by Pete Droge and Elaine Summers. Disc 2 also features the full script, fairly detailed production notes, and cast and crew bios. Both disc menus feature original acoustic guitar performances by Nancy Wilson. The director's cut includes subtitles in English, Spanish and French, as well as 30 chapter stops. Cameron Crowe has succeeded where others have failed in capturing the essence of the importance of not just rock and roll, but music itself. The extended director's cut isn't just excessive fluff; the additions are low-key but necessary, and don't come across as simply cutting-room floor scraps. Dreamworks has assembled a first-rate multi-disc set that should be in every movie fan's collection, so auction off your bare-bones edition of Almost Famous and immerse yourself in the power of music. Long live rock and roll.